There have been lots of rumours and some spoilers floating around the frequent traveller blogs and forums about today's announcement from Marriott International. Some of those rumours are true while some others are not. Invites went out to select people including ourselves for the multiple events running tonight around the world including the Ritz-Carlton Toronto which will see Rewards Canada's Jeff Fredericks attending and reporting back later! It all surrounds the combination of Marriott Rewards and Starwood Preferred Guest. Marriott is giving us some lead time before it happens this August so that we can all get ready for the changes, customers and employees alike for the newly combined program. As is expected there will be some give and take with the unification of the two loyalty programs but in general the give side seems to win out! Now onto to the good news, the press release that is coming out the same time as this post lists a lot of the details of the newly unified program but not all. Last week I had a chance to interview David Flueck, Senior Vice President of Global Loyalty, Marriott International, about all the changes and he revealed even more details to us. What follows is a combination of everything we know from the press release, the media details provided to us by Marriott and from our interview with David. First off, David said they are thrilled to one program with one set of benefits and we have to say that we are thrilled as well! The combination of the three programs will see one program with 110 million members (yes pretty much 4x the population of Canada) who will be able to seamlessly book, earn and redeem at over 6,500 hotels Worldwide from 29 brands in 127 countries. Even though it is one unified program, the three separate programs will continue to run under this one set of unified benefits until the new name for the program is released sometime in 2019. This means you will continue to use Marriott.com, the Marriott app, Ritz-Carlton.com, SPG.com, the SPG app and all associated booking channels until that point but all of the channels will show the entire portfolio of 6,500+ hotels. Yes that's right, you can book a J.W. Marriott on SPG.com if you like. What happens to my Starpoints? This will be just as we have become accustomed to since Marriott bought Starwood and allowed you to link your SPG and Marriott Rewards accounts in that you'll get 3 Marriott Rewards points for every Starpoint you have. Come August it means whatever Starpoints you have will be tripled into the unified program. Members from all three programs will earn ten points for every dollar spent at all brands except for Residence Inn, TownePlace Suites and Element which will be five points per every dollar spent. 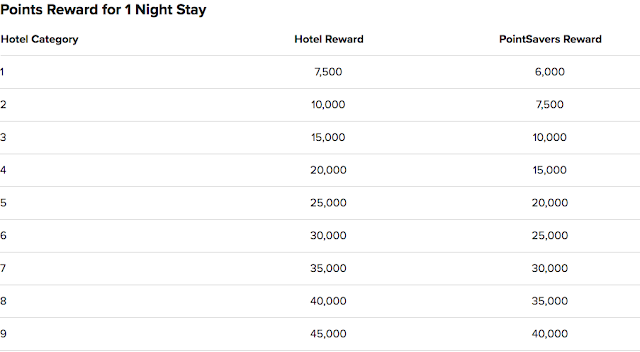 With bonuses, elite members will earn even more for stays, see the chart below. In August, all members will begin earning points for food and beverage and qualifying incidentals on their folio, rather than just the room rate. David stated that on average, members will earn 20% more points per dollar spent then they currently do. That number most likely comes from the higher earn rate that will be seen at Starwood Hotels (currently base level is 2 Starpoints per dollar which equates to 6 points) and for Marriott Rewards members earning on those non room rate charges. Once earned you will still be able to transfer points between accounts for those who live at the same address. First off there were some rumours of multiple elite levels having a spend requirement and David clarified those were not true. It is only the Platinum Premier 100 night Ambassador level that includes a spend requirement. The combined program will have five elite levels over and above the base level. Stay 10 nights in a year and Silver status is yours, 25 earns you Gold, 50 for Platinum while 75 gets you Platinum Premier. Surpass 100 nights and have $20,000 in spend and you'll have Platinum Premier Ambassador status. Lifetime status members will continue to have their status recognized. There will be one award chart for all the hotel brands across the three chains. The new award chart sees eight categories ranging from a low of 7,500 points to a maximum of 85,000 points for a standard one night redemption. This chart will be in place come this August and all redemptions will be at the standard level for the remainder of the year. Then sometime in 2019 they will be adding Peak and Off-Peak awards that will cost 20% more or 20% less than the standard redemption amount. 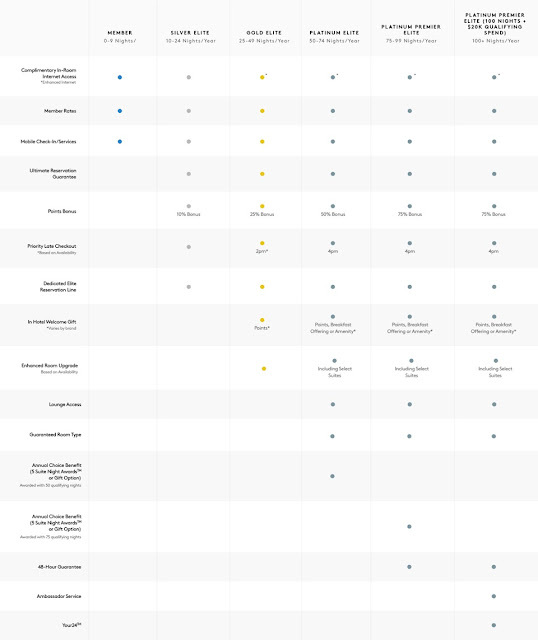 All of this can be seen in the chart below (we have also added the old charts for comparison) There will not be any dynamic pricing that surfaced in the rumours over the past week however others were correct with the Peak and Off-Peak rewards. What we don't know today is what categories all the 6,500 hotels will fall into as the old Marriott Rewards chart had 9 categories, Ritz-Carlton had 5 tiers and SPG had 7 categories. They will continue to offer no black out dates for points redemptions at all their hotels and also continue with the 5th night free benefit. Outside of the select Starwood locations that can charge up to 140,000 Starpoints per night we can see that many category 7 hotels should be cheaper come August as they will only be 60,000 points and potentially move up to 85,000 when category 8 is released. 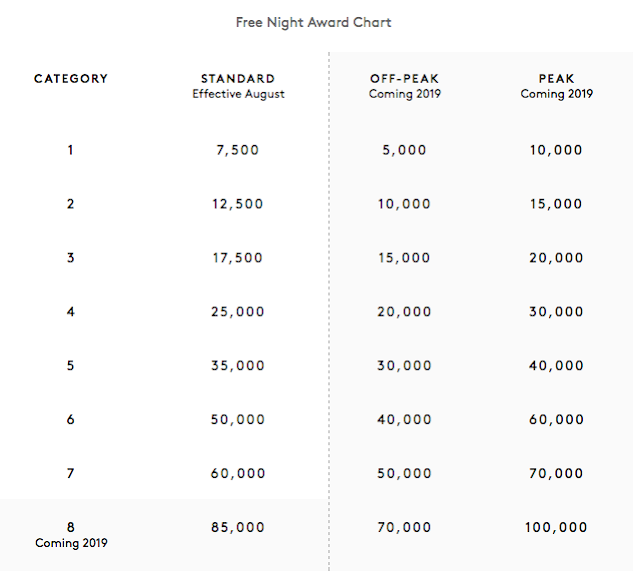 We don't know at this time what those select 'don't have to abide by the award chart' Starwood locations will be charging - will they be following the chart or will they be able to continue to charge more? This is where we may possibly see the worst news. Seeing that the best of the best Marriott Hotels are only 45,000 points right now there is a good possibility some of them will jump to 50,000, 60,000 or even 85,000 points for one standard night. Not to mention when Peak pricing kicks in they'll be a lot more than that. Even the Ritz-Carlton side could potentially see some increases when that 85,000 point level kicks in. For the remainder of 2018 however you'll be able to get those top end Ritz locations for 10,000 points less since the new chart peaks at 60,000 for this year. What was explained to me by David is that more hotels will actually be moving down in points cost than up. He promises there is lots of good news in the new chart and what categories hotels will fall into. One could expect the top end Ritz-Carlton locations to be at that top 60,000 point level. Great news here! Marriott has kept the much coveted SPG airline transfer ratios and by combining the two programs there will be many more airlines (over 40) to choose from one account owning to the fact they did have some different airline partners. The transfer rate to most airlines will be 3 points to one mile (the same as the old SPG 1:1 since Starpoints convert 1:3 to the new program) They are also retaining the bonus for transferring more points. This means if you transfer 60,000 Points to airline miles they will throw in an additional 15,000 points so that you get 25,000 airline miles. 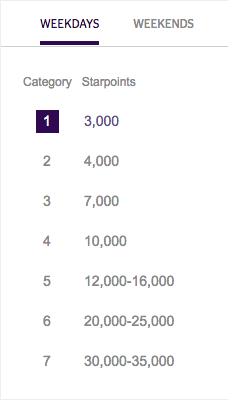 So 60,000 points gets you 25,000 miles which is the same as the old SPG 20,000 points to get 25,000 miles. There is no info on Marriott's very popular Hotel+Air packages in the press release or media materials but David did tell me that they will continue. We'll have to wait to see what the redemption rates will look like with the new categories and of course the different airline redemption rates over Marriott Rewards. As most of you know, the Chase Marriott Rewards Premier Visa card left our market this past March leaving only the Starwood Preferred Guest Credit Card from American Express (and it's business brethren). This card will continue on indefinitely and when the new unified benefits launch it will automatically switch the points earning over to 3 points per dollar spent and possibly 6 points per dollar for stays at Marriott and Starwood locations should Amex choose to extend that promotional offer. I do have one concern that hopefully doesn't transpire. The new luxury version of the SPG Amex in the States will only offer 2 points per dollar on most purchases and I am scared that might be the eventual base earn rate on all Starwood cards including ours here in Canada. Granted the new luxury has a bunch of other benefits including 6 points at hotels, 3 on airfare and U.S. restaurants plus $300 annually in statement credits for on-property purchases, a free night award up to 50,000 points, automatic Gold elite status, a $100 fee credit for Global Entry, Priority Pass Select membership and more. Perhaps the lower earn on most purchases with the luxury card is the compromise for all the other benefits. Fingers crossed that's the case and fingers crossed that maybe we'll get a luxury card too! I did ask David if they were actively pursuing a new partner in Canada to replace Chase so that Marriott would have a Visa or Mastercard option to compliment the Amex portfolio and he said they are but there is no news on that front yet. 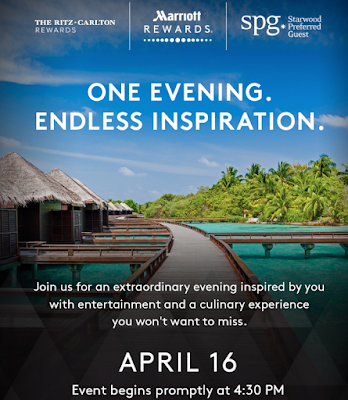 Marriott will be growing the experiential offers they provide from Marriott Rewards and SPG Moments. The 110,000 new Moments experiences in 1,000 destinations can be purchased with cash and are in addition to the 8,000 exclusive, member experiences that only can be redeemed with points on Marriott Rewards Moments and SPG Moments. In the future, all Moments experiences will be available to be redeemed with points. The hotel portfolio that you will be able to seamlessly book, stay, earn and redeem at is pretty extraordinary. You will have over 350 luxury hotels, 150 beach front hotels and almost 350 over water bungalows not to mention every other type of option from small town hotels, big city high rises and more. Can't complain about that and considering they are continuing with the black out date rule you may have some good chances at scoring some amazing stays with this program. To sum it all up, you are really get the best of both of the big programs in the new program. The only unknowns at this time are what categories the hotels will fall into in the new chart and what the air+hotel packages will look like. Those could make or break the good news but we have faith in what David told us that overall the program is getting richer and more hotels will go down in categories than up. 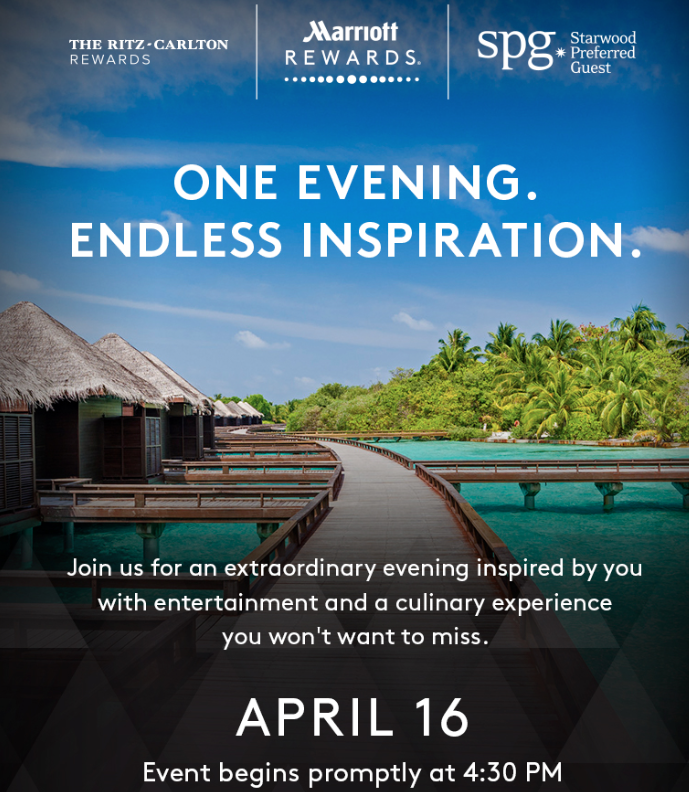 It really looks like Marriott has done their homework and listened to members of Marriott Rewards and Starwood Preferred Guest - and more so to the latter as it has been the SPG members who have been the most vocal and most worried about what could happen to one of the best programs out there. Now let's hear from you, tell us what you think about today's news in the comments below!